St. Croix is an island in the Caribbean Sea, and a county and constituent district of the United States Virgin Islands (USVI), an unincorporated territory of the United States. The island was a possession of France from 1650 until 1733. On June 13, 1733, France sold the island group to the Danish West Indies Company. For nearly 200 years, the islands were known as the Danish West Indies. St. Croix and the Danish West Indies were sold to the United States by Denmark in the Treaty of the Danish West Indies of 1916, in exchange for a sum of US$25,000,000 in gold. St. Croix is the largest of the U.S. Virgin Islands, being 28 by 7 miles (45 by 11 km). It is the eastern most point of the United States and tends to have a fairly consistent climate (generally between 73-88 degrees F) year round. The terrain is fairly rugged with rolling steep hills. The main language in English, followed by Spanish and French. Our unique culture and history reflect the West African, Danish, Spanish, Irish, Polish, and German heritage of those who have made the U.S. Virgin Islands their home since the late 1400s. The rhythms and lyrics of Virgin Islands’ music–including calypso, cariso, soca, reggae, and steel pan melodies–are colorful reminders of our past. Virgin Islanders also express themselves in painting, drawing, sculpture, and photography. The great Impressionist Camille Pissarro is just one of the Virgin Islands’ distinguished artists. Island traditions come alive during celebrations throughout the year. 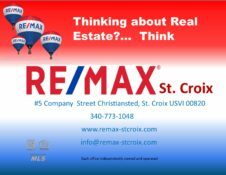 The Three Kings’ Day festival on St. Croix, St. John’s Fourth of July celebration, and St. Thomas’ annual Carnival are just three examples of the dozens of special events that take place each year. However, on any given day, visitors can catch a glimpse of the unique culture of the islands. The history of the U.S. Virgin Islands is as rich as its people. Columbus was given credit for discovering the United States Virgin Islands on his second voyage to the New World in 1493. In the centuries that followed, the islands were ruled by the English, Dutch, French, Spanish, Knights of Malta, and Danes. During World War One, the United States bought the islands from Denmark for $25,000,000 in gold. The U.S. Virgin Islands has daily, non-stop flights from New York, Newark, Baltimore, Atlanta, Miami, and Fort Lauderdale. Connecting flights are available to and from Chicago, Los Angeles, Dallas, New York, Miami, and Atlanta via the San Juan hub. In addition, there’s connecting service from Canada, Europe, South America, and the Far East. Commuter service between San Juan and St. Croix and St. Thomas is also available.